Coagulopathy is well known to be a significant issue in the ED. There is increasing awareness that the early awareness, detection and management of coagulation problems is important for ED management, but it’s tricky. Laboratory based tests may not tell us what we need to know about the effectiveness of blood clotting and as anyone who works in the ED knows, the results may not be back for some considerable time. Karim Brohi spoke at SMACCGold on the subject of coagulation in trauma and those talks will really be worth a relisten when they come out later in the year. Real gold information for us all to learn from. So, interest in the management of coagulopathy is at the forefront of trauma resusucitation and with this there is an increasing interest in thromboelastography and rotational thromboelastometry, techniques that looks at the visco-elastic properties of whole blood as it clots. There is a nice summary of this on the Life in the fast line site which focuses on the TEG system (there is also ROTEM), but it’s a great review of the principles involved. You can also look a the practical haemostasis blog here which has a nice explanation of both. It’s not all positive though. A Cochrane review from back in 2011 concluded that TEG/ROTEM does not improve morbidity or mortality which is interesting. Looking on the main Cochrane site it looks as though this is up for review again soon, but with a focus on trauma patients only. Anyway, a number of trauma centres and EDs are beginning to use these techniques in the resus room. Last year I chose a paper on the subject by Davenport et al. for the recent top 10 papers in trauma talk for the UK trauma conference as I believe this is an area where we may significantly influence patient treatment in the future. In that paper Davenport et al showed that ROTEM could identify coagulopathy in the resus room for trauma patients, predicting massive transfusion at an early stage of patient care. Click on the abstract below for a #FOAMed version of the paper, it’s worth a read. That was then though, what about the now and what about non-trauma patients? The European Journal of Emergency Medicine has just published a trial from Edinburgh looking at the use of ROTEM for the identification of coagulopathy in the ED amongst a mixed population. Reed et al looked at 40 patients with mixed pathologies in an urban Scottish ED. They looked at clot firmness at 5 and 10 minutes using ROTEM predicts maximal clot firmness. Patients were all comers with hypovolaemic shock as opposed to the trauma only patients that we have seen in previous studies. I was interested in this study as ROTEM is a technology that I would like to introduce to Virchester, and I believe that we will be getting one soon to guide management in the resus room. One argument to support the purchase of such a device is to provide information on a broader application than just trauma as major trauma patients are just one subset of a wider group of hypovolaemic, coagulopathic patients that we see in the ED. So, I was very interested to hear more about the practicalities and ease of use in EM. In that regard the experience in Edinburgh is a bit disappointing in that only 40 of 386 eligible patients were recruited, largely due to logistical problems with device operators. This seriously compromises the study as such selective and non-consecutive selection will usually lead to significant bias in the findings. Of the 40 patients included there was good correlation of clot strength at 10 minutes with final clot strength and that’s useful to know, but correlation is not always the best way to analyse this data. When comparing two continuous measures we are arguably as interested in the number of outliers as much as overall correlation. Correlation simply means that as one value rises then so does the other, and if we are comparing two tests of coagulation then it is highly likely that they will correlate. As a clinician we are more interested in whether they agree, which is an important difference. 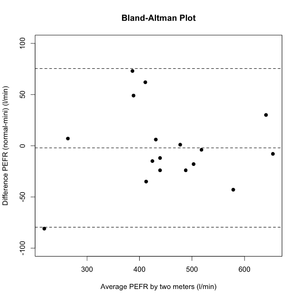 A different approach to measuring agreement and in particular to detect outliers (results where there are significant discrepancies) is a Bland Altman plot. This gives a graphical representation of ‘how different’ the results between test are and also helps show whether discrepancies occur at all values or whether there is variation between agreement at high or low values (very important in the resus room where values are often at the extreme). In this study correlation is shown to be good, and a plot of values suggests that agreement is also good, but I think it’s always good to stop and think when you see correlation used as a measure of agreement for diagnostic tests. In many cases of continuous variable analysis (such as in this paper from EMA on blood gas agreement) Bland Altman is clearly a helpful way of demonstrating agreement across a range of values. In summary this paper presents an interesting insight into the possibilities of using TEG or ROTEM in the management of a variety of patients in the resus room and whilst it is not the final word on the matter it does present some interesting findings that we need to consider here in Virchester. 40 patients can’t really tell us much about the test beyond a proof of concept and in that regard it is a useful piece of work. I am still left with questions though and I wonder if you can help. I’d love to hear more from colleagues who are already using ROTEM and TEG in the resus room. I’d like to see more research published on non-trauma patients in the resus room. I’d like to get my hands on a machine PDQ and hear about your experiences of the practical challenges of using it in the acute setting. Lastly, if you like the blog then please subscribe to email updates (up on the right side of this screen where it says ‘follow us’ for details) and also have a look at the facebook page which we set up fairly recently. All comments and feedback welcome. Thanks Simon, this is one of those technologies that I’ve heard a lot about, but have no practical experience of using. My major question (as with all “new” tests) is how does use of this affect patient orientated outcomes? Does its use alter how people treat patients and if it does, does that bring about an improvement in survival, reduced hospital stay, etc, etc? I think you’re right Iain, my views on new technologies are clear – they should be evaluated with the same mindset as if they were new drugs. However, we don’t do that as often as we should and indeed there are many examples of device harm through early adoption. With TEG ROTEM then we may be in a slightly different position as we know there is a problem that we are currently failing to identify and treat (acute coagulopathy). That may bring forward the tipping point for use, but I absolutely agree that we need a lot more POOs whenever we consider devices and technologies. POO – Patient Orientated Outcomes. Does TEG/ROTEM give us the opportunity to fine-tune our resuscitation strategy for the bleeding trauma patient? Ultimately if they are exsanguinating then their time in the ED short be brief, would that then mean we don’t have enough time to act on the TEG results? In a damage control approach (in the military) it has a place during an abbreviated surgery and in ITU, can we respond quick enough to its results in the ED, or do we use it as a heads up for the intensivists? There’s been work done that strongly suggests that ROTEM results at 5 & 10 mins (A5 & A10) are valid indicators of clotting activity (Woolley et al.) In most systems that means patient is still in Resus when results available. Early utilisation of ROTEM means patients get bespoke management of their coagulopathy ensuring they get the products they need and equally importantly DON’T get products they don’t need reducing their exposure to risks of transfusion and reducing wastage of a prescious resource. I think an import an point is made here. Whilst POOs should be our chief concern, blood stewardship is an important consideration in our resource-challenged world. Even if thrombo-elastography eventually proves not to alter mortality/morbidity, there is still merit in reducing unnecessary use of blood products using empiric formulas. I’ve been using TEG now for close on 15 years in cardiac surgery where it has been shown to be a useful tool in differentiating between different causes of coagulopathy following heparin reversal and the need to re-explore the chest. One of the major advantages of TEG is the immediacy of data which is often gives meaningful results within 15 minutes rather than relying on lab data which is usually only of historical relevance by the time you get it. But whilst there are studies looking at bleeding and blood (and factor) requirements there is a lack of data looking at the hard outcomes we as clinicians want. Can cardiac data be extrapolated to trauma patients? Well, not automatically, which is one of the big problems in trying to study TEG / ROTEM data in trauma because until such time as enough patients have been studied and data on outcomes collected we simply cannot answer the questions being asked. In this respect the Davenport study is interesting as it starts to define ROTEM use in the trauma population by identifying criteria predictive of traumatic coagulopathy. But common sense suggests that if it can be successfully used in the management of post-cardiac surgery bleeding, there is nothing to stop it being used during ongoing management and fine tuning of traumatic coagulopathy at least once the 1:1 resuscitation phase (or whatever your preferred protocol), or damage control surgery has been completed. In addition you guys see lots of other “bleeding” problems in your ED’s which potentially TEG or ROTEM may have a role in assessing. My advice? Get a ROTEM or TEG into your Resus Room and start collecting and auditing data. That’s the only way we can decide whether it has a useful role or not. Train your staff to use it (it’s not that difficult – we have taught a number of our anaesthetic trainees who will now use it and analysis of results isn’t difficult). Get your haematologists on-side early (we have struggled to engage ours who still see TEG as one of “the black arts” as they feel it can never achieve the same standard operating and QC standards as their lab-based tests; however other centres see it differently). We have had a TEG in the trauma room for > 12 months and are planning to move it to the lab (blood bank). Lots of logistical problems getting clinicians trained and getting them to step away from the patient to run the test almost impossible. Agree with Rich that TEG unlikely to change what we do in ED but trending values may prove helpful over the whole resuscitation course. I suppose one of the concerns with ROTEM is that, at least according to the manufacturers, it doesn’t detect the presence of Warfarin, Clopidogrel or Aspirin. It is reasonable to assume thatthat these are significant (and I’ve just been reading a meta analysis that suggests warfarin use doubles mortality in non-head trauma), and common causes of impaired haemostasis in the trauma population. Furthermore, as most protocols use EXTEM, it will miss the use of heparins and haemophilias. In this context, using ROTEM as a rule-out tool for impaired haemostasis seems like it needs some fairly convincing evidence before we adopt it. NICE Diagnostic Guidance “Detecting, managing and monitoring haemostasis: viscoelastometric point‑of‑care testing (ROTEM, TEG and Sonoclot systems)” just out. Supports use of TEG and ROTEM in Cardiac surgical bleeding but acknowledges lack of evidence in trauma citing this as an are in need of further research.